March is Women’s History Month. 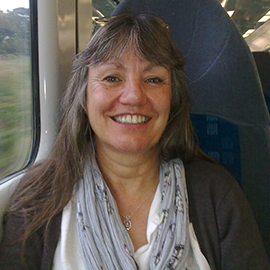 We chat to Dr Marjorie Ghisoni – Lecturer in Mental Health. My mother was a nurse when we lived in Liverpool and my sister was a nurse in Wrexham so nursing was in the family, but after failing my exams I lost motivation and after a few years working in shops and holiday centres I got married and started a family. I always wanted to care for people so I later started work as a health care assistant on the twilight shift (6-10) as I had young children to look after in the daytime. I went back to adult education which was embarrassing for my children as it was in their primary school, and got the qualifications I needed to start my nurse education. What was life like as a student nurse? I loved it! I had worked so hard to get there but it was tough with two primary school age children. It was not easy for me to get onto the course. At the interview I was asked how I was going to be able to care for my children and become a nurse and I was made to wait until the very last minute to find out if I had a place on the programme. This did not put me off, it only made me more determined to complete the programme to show people I could do it. What was life like as a qualified nurse? Becoming responsible for other people can be daunting even though I was a mature student already responsible for my own family. It was actually hard not to continue in student mode and to take time to consolidate the three years of study but I think this was an important time to reflect on my career development. I was awarded a 2:1 BSc Hons degree with Bangor University which combined a specialist qualification as a community mental health nurse. I was very proud of this, especially after leaving school with no qualifications and was still a working mum. Have you ever worked for Betsi Cadwaladr University Health Board? Yes I worked as a community psychiatric nurse in two community mental health teams. The 9am-5pm hours of work allowed me to spend time with my family, it was a really family friendly job. They supported my career development and encouraged me to complete my top up degree. How long have you worked at Bangor University? I have been in higher education for 18 years and the last 4 I returned to Bangor University as a mental health nurse lecturer. During that time I gained my MSc and Registered Nurse Tutor qualification and I gained my PhD. I would not have been able to do this if I had not been working in higher education so it is a great place to work if you want to further your knowledge. It is also a good place to be if you want to research nursing practice and meet other nurse researchers from all over the world. Balancing work and life is a challenge for everyone but when you have other roles such as being a wife, a mother, a daughter and now a grandmother it is a constant juggling act. As my children got older and more independent I became a carer for my mother and spent many weekends looking after her. Then when my grandchildren came along one of them was very ill after birth but I was still working full time and looking after my mother. This was also the time I was completing my PhD and inevitably I became very ill too. This was another important reflective time in my life and I had to start applying what I had learnt about compassionate nursing practice to myself. What are your thoughts on gender equality? I think equality is very important but often misunderstood. Equality is more about diversity. We all have different strengths and skills which we should celebrate, which isn’t always about being equal. As a working mum it is important to recognise your own needs and to seek help when you need it. People often assume that you are coping when you are not. I have a poem on my wall to remind me – Not Waving but Drowning. Being more compassionate about gender equality is something we should be focusing upon more and recognising that whatever gender we are, we are not all the same. I would like to see more discussion on diversity in all areas of our lives. It makes me quite cross to see women trying to be like men so they can develop their career. Finding time to relax and reflect is very important which I only really learnt when I became ill. I have become more self-compassionate now and do not feel guilty for doing things that I enjoy. My ‘me time’ is very important and I try to fit it in every single day. This can be going for a walk, doing some crafts, or gardening. I also still enjoy reading and writing. I always say to my students two words of encouragement – keep reading! When I was a busy working mum I used to find the only place that I could read in peace was in the bath! Now with modern technology we can read anywhere although I did have to get a waterproof cover for my e reader just in case I still wanted to read it in the bath.